I’ll always remember where I was when Greg Ostertag retired from pro basketball for the second time. Part of this is my doing (mostly via the throwaway gift of SLAM magazine’s special issue dedicated to the top 500 NBA players of all time). But he doesn’t need me anymore. He finds YouTube clips and books on his own now and has disappeared into his own world. But he’s also, thankfully, still a 7-year-old kid. “He has really big shoes. Wonder what size he is,” Isaac says to me, giggling. We are at Frisco’s Dr Pepper Arena, home of the NBA D-League’s Texas Legends, but he’s not looking at the court, so he’s not talking about Sean Williams or Greg Ostertag or any of the other players. He is talking about Dunker, the Legends’ mascot, a man in a blue-and-white plush dog suit with, yes, a pretty giant pair of kicks. Dunker is connected to bungee cords and jumping up and down on a trampoline located behind one of the baskets. All of this is a cornerstone of the Texas Legends experience. It has to be. Unlike, say, minor league baseball, the team can’t really sell the idea of seeing future stars on the way up, or even current stars on rehab assignments. Most of the players for the Legends (and their opponent tonight, the Oklahoma City Thunder-affiliated Tulsa 66ers) are barely on their way up—and probably only to a contract with a foreign team—or very definitely on their way down. Instead, D-League basketball in general, and the Legends specifically, has to be sold as a fun and fairly cheap (most tickets are around $20) experience, not just a game. Mostly, a Texas Legends game works quite well as family entertainment, a few possible missteps aside. For instance, I don’t know if I’d include Soulja Boy’s “Crank That (Soulja Boy)”—with its please-don’t-look-this-up-on-Urban-Dictionary “Superman that ho” refrain—on a mix for kids. But there it was, blasting through the arena prior to the game. That aside, the game provides the two essential elements of quality family entertainment: distraction and safety. Isaac and I spent some time in the kids’ area before the game tipped off, obviously, because he wouldn’t pass up a hoop set up in the middle of an active volcano without taking at least a few shots. Just before halftime, when he wanted to go back, I let him go off on his own—and I think that had much more to do with the atmosphere and less to do with my possibly being a dicey single father. That idea continues through just about everything. Like an NBA team, the Legends have their overwrought, darkened-arena player introductions. But the light show that usually accompanies such things consists of two small spotlights on either end of the arena, visibly being spun wildly around by two Legends employees. 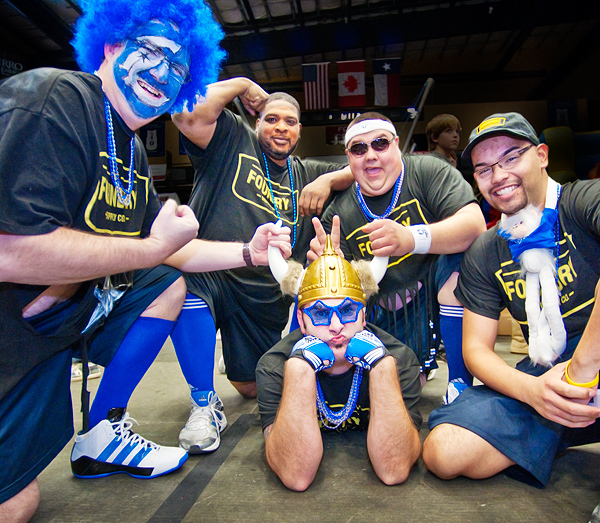 They also have their own version of the Mavs ManiAACs, a burly troupe of guys called the Frat Boys, in belly-baring shirts and Viking helmets and “crazy” sunglasses, sponsored by The Foundry Big & Tall Supply Co. They have a real dance squad, too—though the phrase “the hottest dance team in the NBA D-League” probably tickled me more than it should. And the Legends have half-scale fans, too—dedicated but maybe not diehard. The guy in front of me, with a long, graying ponytail and the mustache you’d expect to come with it, was very vocal, but had sort of a studied familiarity with the names he was calling out. I feel like he wouldn’t remember the names later if you asked him. Ostertag, a 7-foot-2 Duncanville native who spent 11 years in the NBA (mostly with the Utah Jazz), signed with the Legends this season after five seasons in retirement. He was, to put it generously, not in game shape. He looked like he was wearing a bulletproof vest under his No. 99 jersey, and he ran like an old action figure before they had the technology to articulate all the joints. But that was enough for Isaac. I don’t think Ostertag will be pitted against Russell or Shaq in any future what-if scenarios, but he is now in the conversation. On the ride home, we talked about Ostertag’s NBA career more than anyone outside his immediate family has in years, or perhaps ever. I’m sure Isaac has already tried to look him up on YouTube. Ostertag is part of the obsession. Which actually makes me worry a little bit about my son, but I’m going to ignore that for now.